The Green Chamber / Martine Desjardins; translated from the French by Fred A. Reed & David Homel. I was eager to read this new translation of Martine Desjardins -- I have read all of her books so far, which have all been translated by the same team and published by Talonbooks. 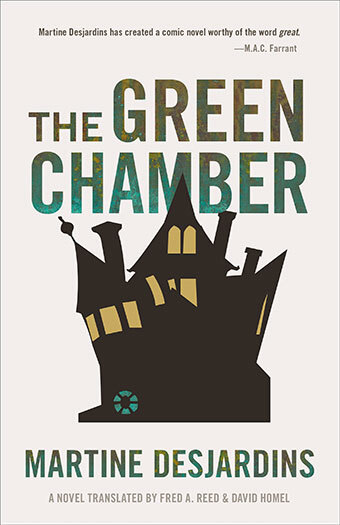 The Green Chamber is a little different from her earlier works. It's much less seriously gothic, more Addams family. And it is darkly hilarious from the first page, when you realize that the narrator of the story is the rambling, ramshackle house itself. The story moves between 1913 and 1963, revealing the lives of three generations in a Quebec family that made their fortune in the first generation, hold on to it in the second, and finally lose it in the third. But none of it is what you'd expect from a story of wealth across the generations. The characters are all peculiar, with strange names (ie: the three spinster sisters Morula, Blastula, & Gastrula) and have disturbing personal habits -- whether extreme hoarding, obsessive cleanliness or compulsive thrift. It's dry, archly funny, and bizarre in the very best way. From the backstabbing between siblings in the first generation to the repudiation of greed in the last, these characters are either hand rubbing villians or innocents, with one character who is a little of both (but then she's not family).Vincent (Vingt-cent) and Penny Sterling are the youngest generation, and together they are going to overthrow the past and escape from the constraints of wealth, greed, and hoarding. While the house prefers that they might use that wealth to fix it up a little, it's also very understanding. Commentary by the house on what is going on inside of it, with people who rarely leave, is one of the most entertaining aspects of this tale. Wacky disasters, losses, manoueverings, desires and family secrets all come together to create a dramatic denouement that is foreshadowed from the opening pages. This family who has made a literal religion out of money faces disillusionment when their god of mammon is revealed as having feet of clay. And the house is left hoping for a restored life when the last remnants of this family finally depart; maybe someone new will take it on. The style of this story makes it a quick read. It's funny, dark, and original, and the translation captures all the essential Quebec flavour of the setting, an alternate kind of Westmount/Outremont neighbourhood. I can see this as an indie film; it reads like a blend between Wes Anderson and the Triplets of Belleville. Pure entertainment, and I enjoyed this read immensely. I recommend all of her books, and would love to see her read more widely. The commentary by the house sounds intriguing. Excellent review, Melwyk. I will keep this new book in mind. It was an entertaining element -- started it all off on the appropriately odd note!